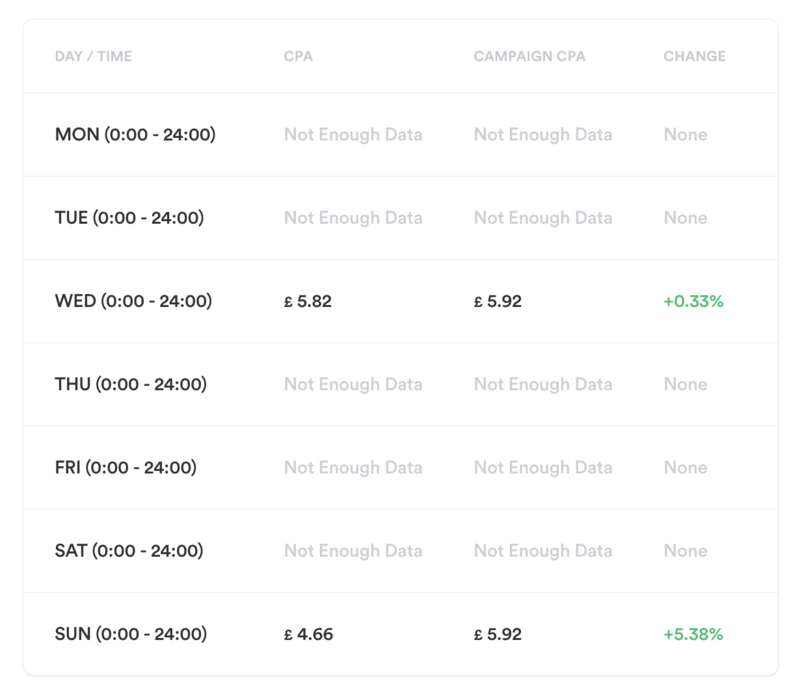 How optimising your ad schedule bids can increase exposure and prevent wasted spend. Why Adjust Ad Schedule Bids? Bid adjustments exist at the heart of any optimisation strategy. Discover particular times when your target audience frequently converts allows you to squeeze performance improvements from existing campaigns. Ad schedule bid adjustments use data to reduce your ad spend at poor-performing times and increase your exposure during historically successful periods. You'll see this improvement if we’ve found an opportunity to improve campaign performance via ad schedule bid adjustments. If your campaign doesn't already have a bid schedule set, we’ll propose one based on recorded data. If you do have a bid schedule set, we'll apply our adjustments to your existing time slots. Today, Opteo never modifies the time slots you've defined manually in AdWords — only the bids. Green bars represent time slots with a low CPA, where we recommend a bid increase. Red bars represent periods of high CPA and suggested bid reduction. Grey bars represent time slots where we won’t be applying a bid adjustment. White bars represent times your ads aren’t currently running. Deeper colours indicate the segment is further away from the CPA target. We'll also provide a table where each row represents an active time slot. You’ll find each periods' CPA performance, the campaign's average CPA, and our recommended bid adjustment. When you complete this improvement, we'll apply all bid adjustments at once. We look at data from the last 90 days. Your schedules will frequently show lots of grey or blue because many slots won't collect enough data to confidently calculate CPA. Our suggestions range from -30% to +30%. If you've already got bid adjustments applied, we won't overwrite them — they'll be merged via multiplication. It's useful to know that internally, AdWords saves bid adjustments as decimals (e.g. +12% as 1.12, -40% as 0.6). So, applying an adjustment of +20% (1.2) to an existing +30% (1.3) will yield a final bid increase of 56% (1.2 * 1.3 = 1.56). AdWords caps adjustments at +/-90%. After you complete this improvement, we'll stop checking that campaign's ad schedule for 90 days to let new CPAs settle.